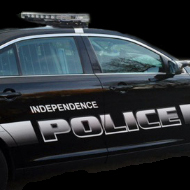 Independence Missouri Police were involved in a police chase this afternoon that ended at Truman and I-435. The male suspect crashed into another vehicle and then fled on foot for a brief moment before being taken into custody. The man was wanted in Kansas City, Missouri for a felony charge. The vehicle was also stolen out of Georgia.